Meet 16-year-old Kelvin. He was diagnosed with Duchenne muscular dystrophy. He cannot walk, and many other capabilities are limited. Kelvin needs help with daily living tasks. This young boy’s challenges do not hinder his teenage life. Kelvin enjoys many popular activities. He is a fan of superhero films, especially The Avengers. He also watches soccer; his favorite team is Barcelona. Kelvin is social, too. He hangs out with his friends, and they bond over a round of video games. One of Kelvin’s best friends, however, is his dog. They spend many afternoons outside playing ball. Afterwards, a tired Kelvin and his dog will take a nap. Kelvin is even studious in school. He diligently works to get good grades. Kelvin might seem like a normal teenage boy. Include his challenges, and he becomes an inspiring hero. 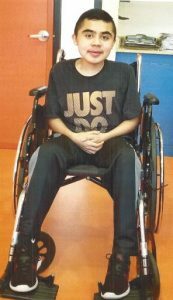 Kelvin needs a therapy tricycle to help him exercise and improve his overall health. Please be his sponsor!